What a HUGE 6 months it has been. 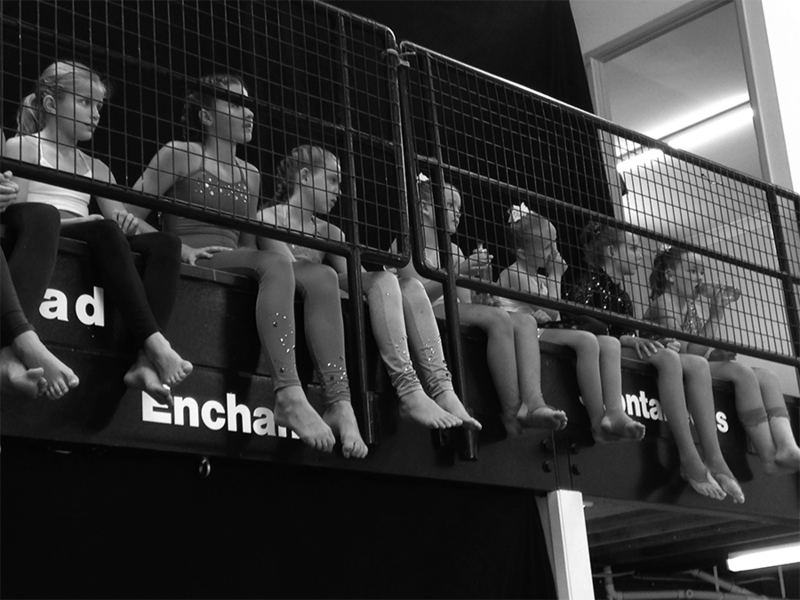 Not only have I been working on a routine for Skyfall, but I also met one of my all time favourite aerialists and started working on double hammock. 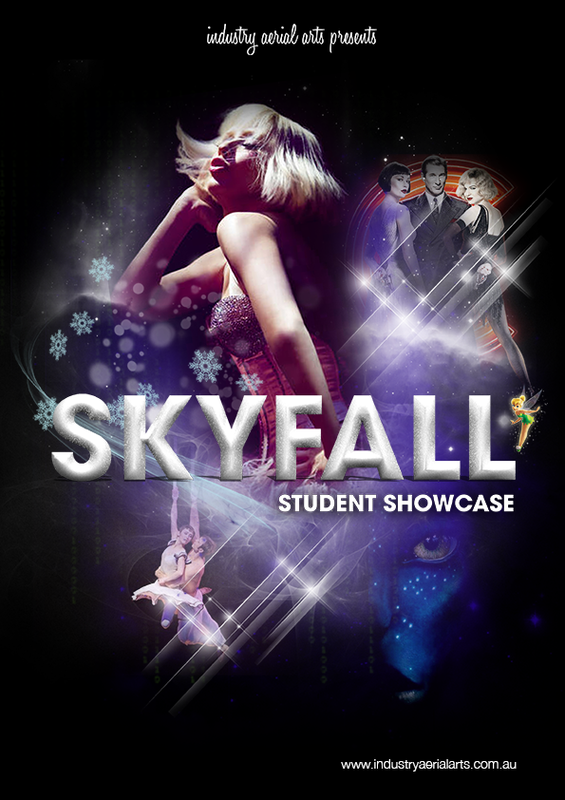 The people I have met and friends I have made along the way have warmed my heart completely and I think that is what made SKYFALL such a successful show: the aerial family. Tammy Zarb’s vision for the show was inspired by film and theatre which included music and routines from Chicago, James Bond, Burlesque, Avatar and many more. I chose a Beatles song from the Cirque du Soleil film ‘Worlds Away’ which focuses on a young ladies dream to find a loved one through the crazy and wild adventures of the circus. It included some amazing music but ‘While my guitar gently weeps’ is a favourite for me because it is one of the first songs I learnt on guitar as a teenager. Back then my ultimate dream was to become the worlds best female guitar player and through working with other musicians and bands I used music to inspire me. 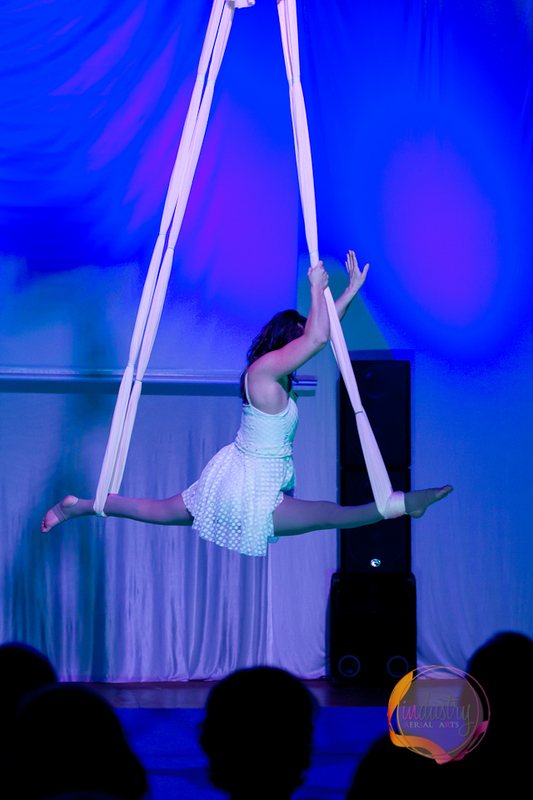 Since my accident my music dream was put on hold and so it was great to incorporate my passion of music with my new love of aerial by choosing a song that has a bit of my past in it too. One of the hardest things about having a spinal injury in the beginning, is you feel as though you loose part of your identity and the things that were a huge part of your life before actually don’t feel like they belong to you anymore. Its a strange feeling and hard to explain but I struggled at first with the loss of playing music; it actually felt as though I had a break up and every time I picked one up I felt a little pang of hurt – like I had broken my own heart. There was no reason I couldn’t physically play anymore but it felt as though it belonged to a life I had years ago that i no longer did. 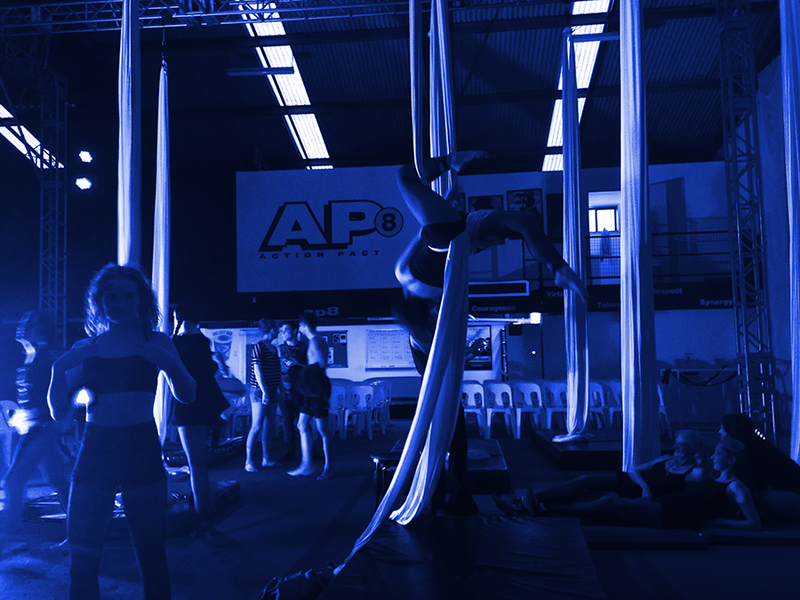 So I had to find something else that filled my heart with as much passion which is one of the reasons aerial is so important to me. Leading up to the show I had the privilege of designing the logo for Flyworx Entertaiment Gold Coast, a World Class training for Aerialists, Dancers, Gymnasts, Cirque, Stunt & Flying Performers. Part of what Flyowrx has to offer professional aerialist and stunt folk alike is their workshop WHAT which allows participants to work on specific skills, get out of their comfort zone and work closely with professionals like Dreya Weber who has worked with some of the worlds most amazing performers including Pink, Kylie and Cher. I bit the bullet and had a private lesson with this wonderfully friendly and warm woman and it was such a great hour. 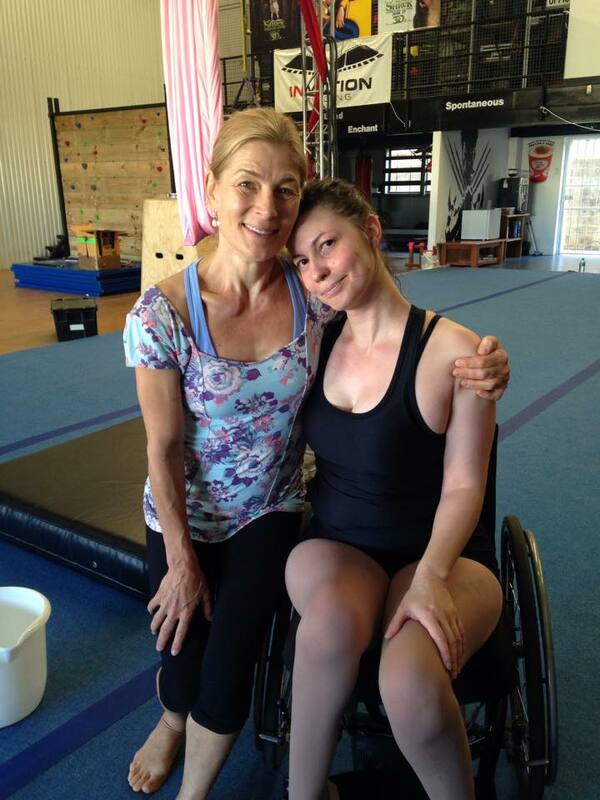 I worked on spinning, tried a few new things and she was so encouraging and not afraid to ask me questions about my disability and share in some close personal experiences that really touched me. We played around on the hammock and it was so much fun to share that joy and excitement with someone who has made it a huge part of their life, just the way you want to. Check out her youtube channel for some amazing and inspiring footage of her work. The show day came and sold out in the first few hours and so a second show was scheduled which got us pretty excited to be performing 2 nights in a row. There was a sense of achievement that i could feel radiate throughout everyone that all this hard work, sleepless night and sore limbs was going to pay off and it did. Throughout the rehearsal and show nights the vibe and support among everyone was intoxicating and you couldn’t help getting wrapped up in the joy of performing and having everyone see you in a different want than they usually do. I was a little nervous on the first show night but I felt comfort in knowing I had a partner that I felt comfortable with and rigging from the best in the business. Before i went out on the floor, Tammy gave me an introduction that told of my story of coming to IAA, and being rejected by the schools I approached to take me. Tammy Zarb took me in with no doubt in her mind that I would be able to do something and throughout my whole experience I have received so much support, encouragement, phone call check ins and text to keep my journey alive. I don’t know If I will ever be able to express in words or images the gratitude I feel towards her – I owe her and the instructors a piece of my heart. From the moment the music started I was wrapped up in the story and everything around me melted away and all I could do was feel by body move and it felt so free. I felt amazing, fluid, graceful and all the things you want to feel when your expressing yourself through music and movement. The feeling, is by far the best feeling in the world and was so liberating to know that I belong to an elite group of strong and ambitious woman and men who all strive to feel the same way I do in the air and for those 3 minutes I belonged to a minority that everyone wishes to be a part of. It was bliss.